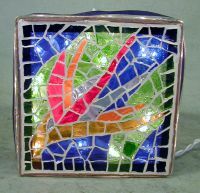 Mosaic glass blocks come in 2 sizes. 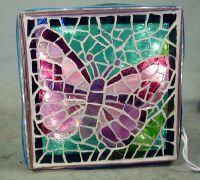 The larger size is 7.5" square and 3.5" thick. The smaller size is 5.5" square and 3.5" thick. and a ribbon around the sides. hallways, on a buffet, etc. More patterns will be avialable and pictures will be posted. 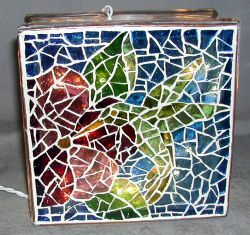 Custom patterns can be designed for you.